I have a confession to make. I never read The Borrowers growing up. Apparently I'm one of the few who never did (and I'm not totally sure why that didn't happen) but I have now rectified the situation. But only because I was pressed - by a library find - to do so. The Borrowers if you are unfamiliar, like I was, with this story, was originally published in 1952. The book tells the story of a family of little people who live under the kitchen floorboards in an old Victorian house in England. The family consists of Pod (the father), Homily (the mother) and Arriety (the daughter). Borrowers are tiny people, much like The Littles, who live in the homes of big people (aka "human beans") and "borrow" things which they need to survive. In the mind of the Borrowers, the "beans" exist solely for the purpose of the Borrowers - to meet needs. Where The Littles seem to be a more friendly sort, watching over the house when the Biggs leave town for instance, the Borrowers are eternally suspicious of these larger humans. The worst thing in existence for a Borrower is to be seen by a "bean". Once you have been seen, there is a great need to emigrate so as to escape further detection and exposure. In The Borrowers , Pod is the Borrower who leaves the family home in the evenings to gather supplies while the "beans" are sleeping. Arrietty is feeling lonely and confined in their home under the kitchen and longs to go out borrowing herself. Better still, she'd like to explore the great outdoors, run through the grass, gather flowers, etc. Her father finally permits her to join him on a borrowing where she is accidentally seen by a boy who is visiting the house. The rest of the story tells of the Borrowers dilemma in having been seen and determining how they are going to make their escape from the house. Between The Littles and The Borrowers, I have to say I like The Littles more. (If it's up for a vote, that is.) Not to say that I didn't like The Borrowers, because I did! It was a fun, diverting story. But I found it more darker in tone than The Littles because there were only three Borrowers (as opposed to a few generations of Littles living with one another) and I could feel Arrietty's loneliness. Who would want to feel so very alone? I would want to get out of that house under the kitchen as well! Then too, I didn't really care for the way that Pod and Homily related to one another. Pod seemed so very dark and depressed to me - sort of a dyed-in-the-wool Borrower who couldn't see a reason to change anything. (Which is expected of him and not wrong for his character. I just found it frustrating.) Homily shrieked and worried too much. (Again, I think her reactions to the situations were perfectly reasonable and I probably would shriek and worry a bit by having been seen when that posed so great a danger. I just found them both ...wearisome.) By contrast, the The Littles also lead predictable lives but they are more prone to adventure or are up for trying new things when situations are proving to be in need of a fresh new idea. I started reading this one to Bookworm1 but it didn't grab him either. We'll definitely try it again (with plans to read the whole series) and I'm glad to have read it. I just think that we're more suited for The Littles at the present moment. Bit of family history to note: apparently this was my mother's favorite book in third grade. So you know that means we have to read the whole series at some point! My daughter read it and enjoyed it (so much that she read one of the sequels). Guess we should get around to reading the rest! We haven't seen the movie yet so I'll be reading your blog tomorrow to see what you thought! 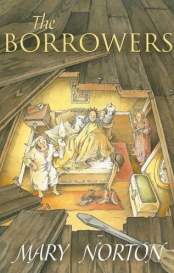 I've never read The Borrowers or The Littles, but somehow I vaguely knew it had to do with little people living under the main floors. You should definitely try the later books, once they venture out into the world. They do find a few other borrowers. There's still probably a bit of a grim tone, but that makes the courageous survival of the Borrowers all the more heroic. Nope, never heard of this one. You are NOT alone! Sounds pretty good though. I vaguely remember The Littles...been a while. I haven't read The Borrowers either. It definitely isn't just you! ;) Sounds like an interesting story though. Looking forward to your thoughts on the movie! It shouldn't surprise anyone that I've yet to read this series. I have picked up 2 of them used, and hope to change that soon, though. I'm really hoping you liked the movie! I'm afraid if you didn't, I'd just have to skip the books, so I could enjoy the movie more. I've grown fond of those anime movies! Other than knowing it was of little people, I didn't remember it. I own my childhood copy still! Something I can't say too often. Thanks for the reminders...M has read The Littles (a few of them) but we haven't tackled this yet. Can't wait for movie thoughts...and if it is family friendly! This is a very timely post, Carrie. Our church is showing that movie tomorrow night, and though I enjoyed the book, I wasn't super-excited by the preview. I am so curious to read your thoughts about it! I distinctly remember owning a copy of The Borrowers (thanks to Scholastic) but as I read your review I concluded that my memories are probably from The Littles TV cartoon. Thanks for reminding me of both books. I think my boys would enjoy reading them! I read those books over and over again and because of those books read all of her other books. With mixed results. I'll echo everyone else, the books are so much better as they go on in the series. For some reason I'd always thought "The Littles" was a TV version of the Borrowers and was a rip off, I didn't know there was books for them. I lived in this series after my Ramona and Henry phase and before Nancy Drew and the Hardy Boys. I loved it! My boys don't seem to enchanted, maybe ZGirl will when she's a bit older. Ok, now I am getting The Borrowers and The Littles confused. I think I have read both, but if I only read one it was The Borrowers. Can't wait to hear about the movie.